Hi! 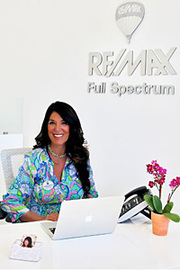 I'm Carmielle Waltz from Full Spectrum Properties. I have spent many years of my life dealing with people on a one-on-one basis. I know how to listen and that's a great quality to bring into Real Estate. This is a field where hard work gets the job done, and I'm the one for THE JOB! I'm a very social and outgoing person, so you can count on me to return your calls promptly. I'm fortunate to have a lot of contacts in Northern California, which happens to be a special place to live. I believe strongly in the benefits of family and friends, and the rewards of making people's home ownership dreams come true. I'm thrilled to be in the Full Spectrum family, and I mean that literally!